I feel like I haven't quite found that Knob Creek Rye that I love. I can't get enough of the private selection bourbons, having found a few amazing bourbons among them, and at the very least, always a very good bourbon for a very good price. 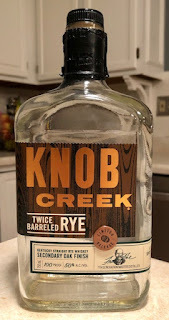 As for Knob Creek ryes, however, between the regular rye and the few private selections I've tried, I have yet to find that "very good" rye, one that comes off as exceptional. That being said, I still keep looking, and in recent months I've grabbed both the barrel strength rye and this bottle, the twice barreled rye. I can't help myself when I see a limited release (though I don't know just how "limited") at a decent price. The nose is full of spice, mostly cinnamon, but other baking spices as well, along with a distinct oak quality (true to its name). There's a slight pine note as well on the nose, but the cinnamon and wood notes really prevail, almost like a subtle cinnamon stick. The flavor is far more complex than the nose, however. On the first sip, I immediately got notes of maraschino cherry and amaretto, a nice, rich blend of dark fruits with a more decadent nutty flavor. I also got the cinnamon from the nose, though not as heavily as I expected. All of this is underscored by a light layer of unsweetened vanilla. On the back end there was a mint note that seemed to linger forever, almost cooling the back of the throat. Meanwhile, I was smacking my lips as they seemed to stick together. It was as though after each sip, powdered sugar came into the picture to balance out the cinnamon spice. In later pours, while the cool mint note was still there, I found that I noticed more a sweet caramel stickiness that not only stuck on my lips but hung around at the back of my throat, as though I had just let a soft caramel dissolve in my mouth for the last half hour. Compared to other Knob Creek ryes (and most other ryes I've had for that matter), this is sweet and spicy, and complex in that it offers all sorts of flavors from front to back and from pour to pour. It had a nice, oily and sticky mouthfeel that you find in older and higher proof bourbons, and it was absolutely delicious. I should have grabbed more!